Did anybody notice the door to 920 mass is now open? read the tweet from The Roost this past (Sidewalk Sale) Thursday. I was surprised to hear of their opening in such an unexpected way! Needless to say, I was thrilled to finally welcome this new kid on the block to Mass Street. Though truth be told, this ‘new’ kid ain’t so new; these peeps have been in the business for quite some time, and they know exactly what they’re doing. Having connections to the previous occupant (ahem), Manda and Sean Jolly decided to do their own thing and spice up the space. And aren’t we glad they did? If you haven’t been to The Roost yet, here’s my advice: go. Go now. Not too much of a presence yet, but for the time being they don't need it anyway. 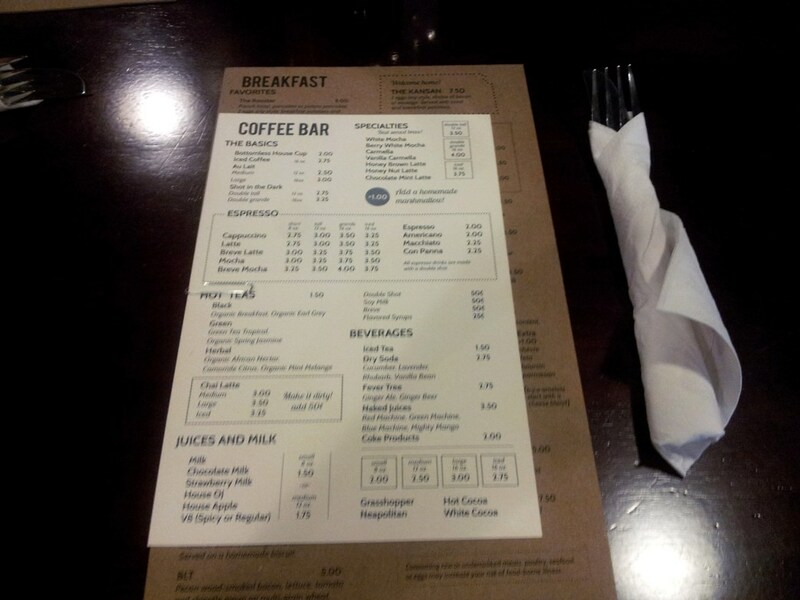 Attractive and organized menus. Well designed, easy to navigate. Starts us off on the right foot! While I didn’t get to The Roost on opening day, I made plans to meet a friend for 11:30am brunch at The Roost on day two of business – Friday. It wasn’t swamped, but the space was certainly busy; there was a buzz in the air, likely from the mixture of fresh coffee and excited locals. We were seated just as quickly as we entered the door, and while we made ourselves comfortable I took in the new environment. 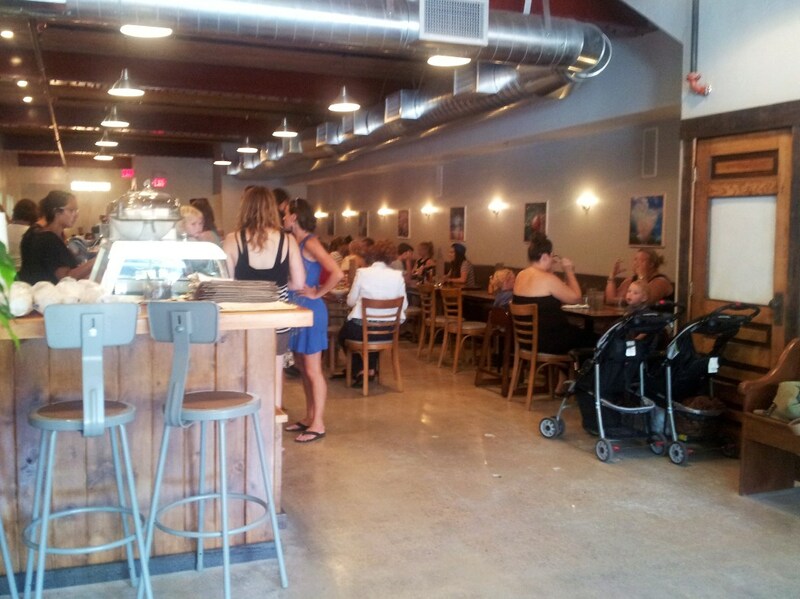 The space is expansive – I’d guess they have seating for something like 80-90 people (!) There’s seating up front, near the entry way, in the middle, and even in a back lounge area. 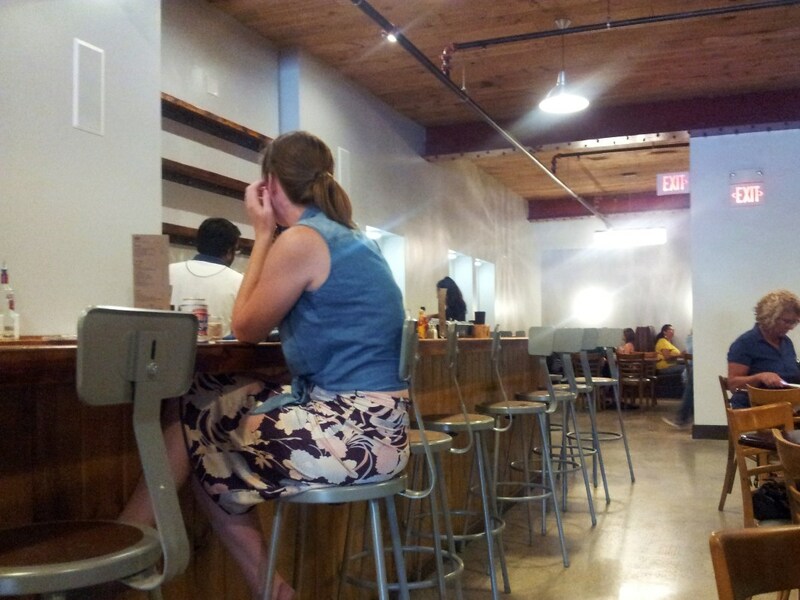 I also was happy to see a bar area with stools. It made the restaurant feel more versatile. As for the decor, it’s very minimalist and simple. There are select pieces of artwork along the southern wall, but otherwise, the interior is basic and fresh. This makes it easy to focus in on what’s important: the menu. I have to say, The Roost’s menu wooed me! It’s easy to navigate, not overwhelming, and beautifully crafted. These things are important, no? Who wants to start a meal off feeling overwhelmed and confused about the menu? View from the front entry way. View from the back seating area. 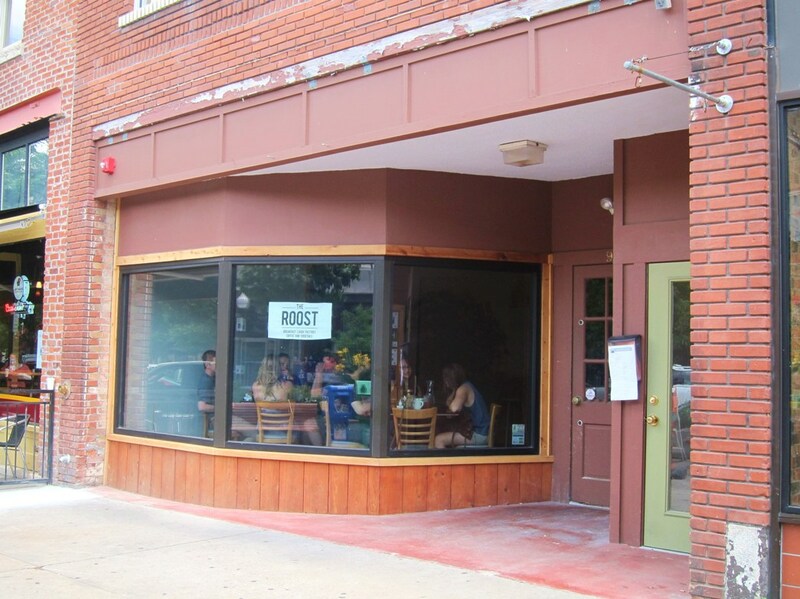 The Roost offers tempting breakfast plates, baked goods, “sammys,” salads and soups. While my initial interest was the “eggs benny” (eggs benedict), I decided to cut loose and let my hair down a bit – helloooo, portobello sammy. 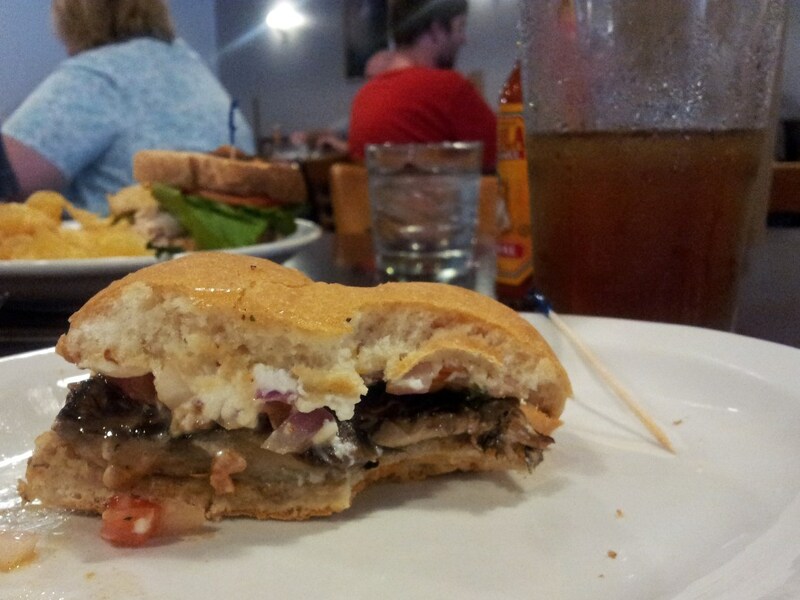 This guy boasts a marinated portobello cap roasted and topped with tomato/basil relish and chevre on an Italian roll. My friend went with the roasted turkey club, which consists of turkey, lettuce, tomato, bacon, herb, mayo, Swiss and cheddar on sourdough. 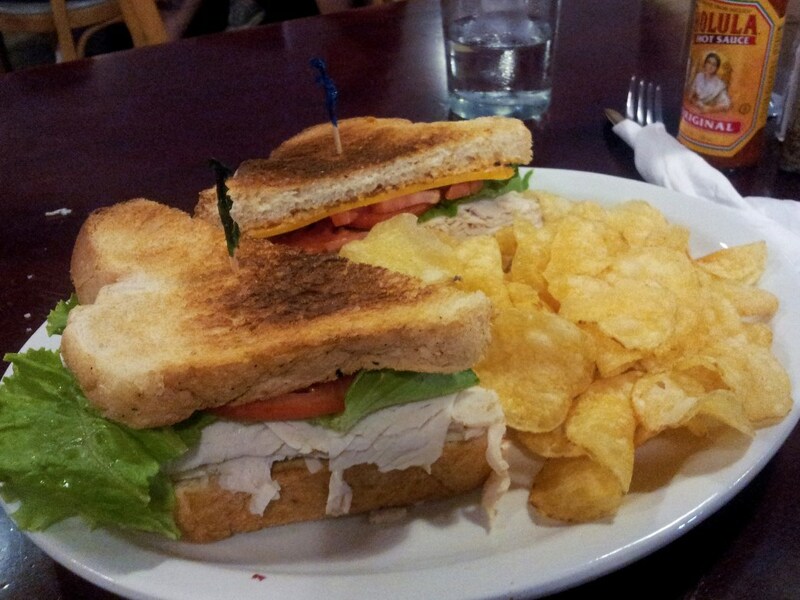 Both of our sammys came with a side (your choice of chips, side salad, or soup). We placed our orders and in no time our meals arrived. We were both pleasantly surprised with the attractive creations sitting before us. The roasted turkey club was piled high with fresh turkey (but not too high – there was no awkward contortions of the mouth needed to eat this beauty), and in good company with a pile of crisp potato chips. 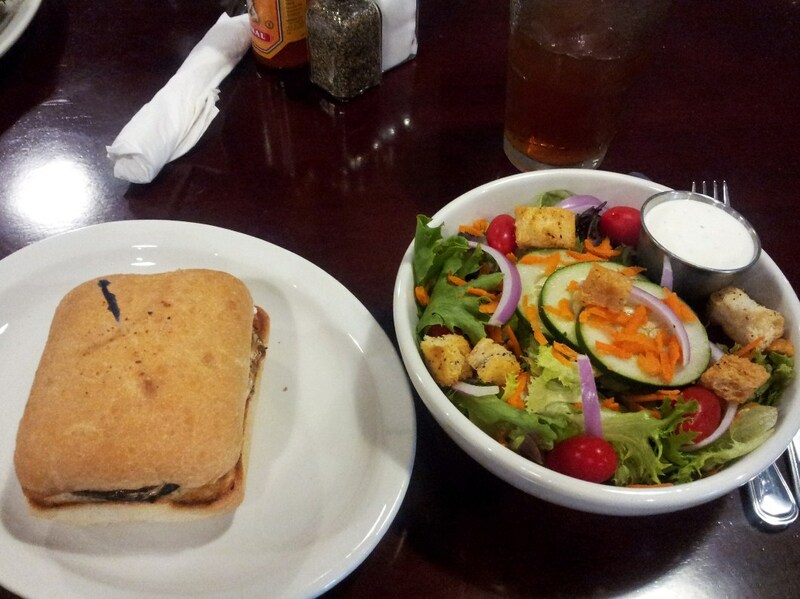 My portobello sammy looked trim and clean, and my side salad arrived in a deep dish (hooray! no mini side-salads here), decorated with veggies and croutons. Bon appétit! The bar, peering down to the back seating area. Best buds: roast turkey club + chips. The lone portobello sandwich + well-decorated side salad. Perhaps unnecessary, this photo captures the delectable nature of this sammy. So here’s the thing: that portobello sammy up there? – The most amazing sandwich I’ve had in a ages! The flavors came together in a magical way, and my tastebuds were throwin’ a party for the occasion. The tomato/basil relish and chevre rocked it. And my buddy was pleased with his roasted turkey club. Although, he did need a to-go box for half of his colossal sandwich (never a bad thing to take home some goodness for later). The total for my portobello sammy, side salad and iced tea was a bank-breaking $9.66 (ha ha). Including tip, my meal was a little less than $12 for lunch. Now that’s impressive. 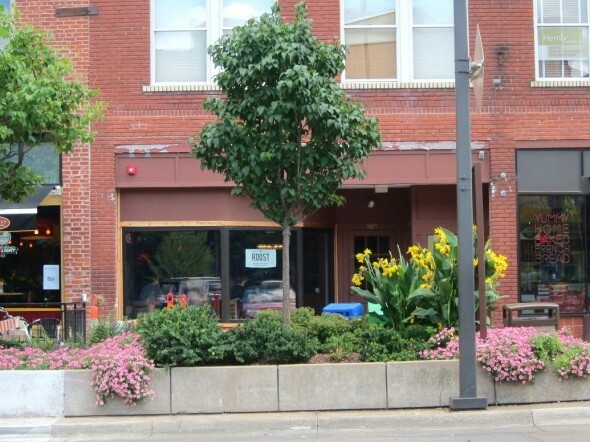 Great food, pleasant atmosphere, and fine service. The Roost, welcome to Mass St! You’re delightful and we’re lucky to have you. This entry was posted on Monday, July 22nd, 2013 at 12:22 am. 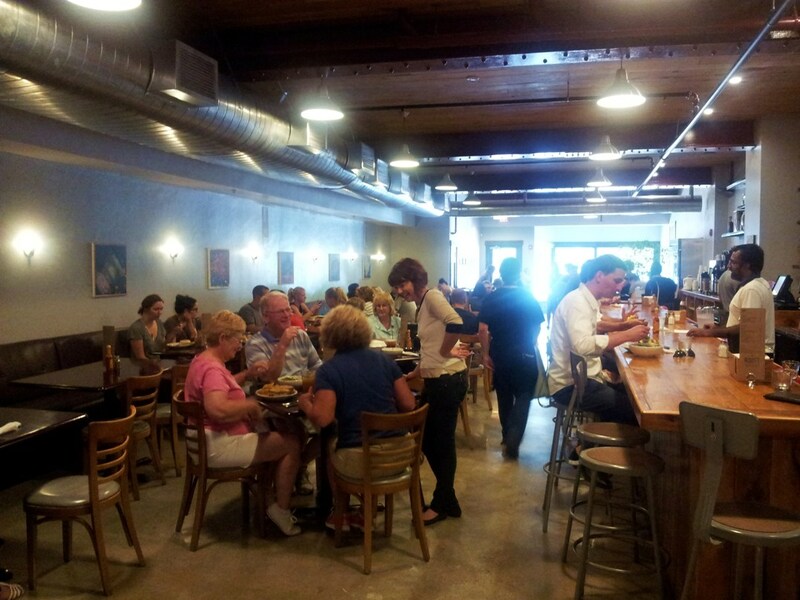 It is filed under Restaurants and tagged with brunch, coffee, drinks, lunch, restaurant. You can follow any responses to this entry through the RSS 2.0 feed. We had breakfast Sunday morning and really enjoyed it, too. It was a teensy bit slow–although our perception of time may have been out of whack because of our wiggle-y toddler–but we’ll definitely be back!